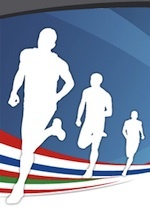 Running competitions for different fitness levels, and a fundraising walk. All routes are within the Principality. There's a running exhibition at Port Hercule, with free entry for the public. All events depart from Port Hercule. Registration on the day is not possible. The runs are organized by the Federation Monegasque d'Athletisme (FMA), and the walk by Pink Ribbon Monaco. For more information phone +377 92 05 43 05, email office[at]monacorun.mc, and for registration, visit the organizer's website at: Monaco Run website.